Travel back in time with Dinosaur World Live! tickets! On sale now! If you’ve been on the look-out for a roar-some interactive show for the whole family, then look no further than Dinosaur World Live! Tickets for this spectacular experience are just the thing for your dinosaur-obsessed kids (it’s okay if you’re the dinosaur fan – who isn’t?). This showcase of dangerous and delightful dinosaurs will be coming to the Troubadour Wembley Park Theatre from 18 July to 2 September 2019. Are you ready to dive back in time and explore a pre-historic world of astounding dinosaurs? If you’re daring enough, then grab your compass and join the fearless explorer, Miranda, as they take you to unchartered territories to discover a whole range of remarkable creatures. Here’s your chance to meet your favourite dinosaurs, including the Triceratops, Giraffatitan, Segnosaurus and of course, the Tyrannosaurus Rex, just to name a few. 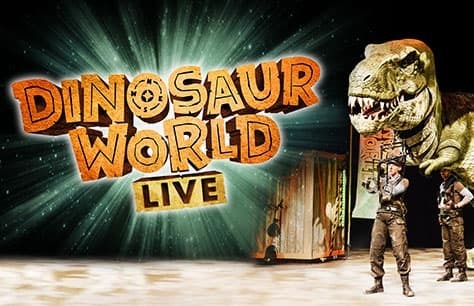 If the odds are in their favour, your dinosaur-crazed little ones could have the opportunity to go on stage and help feed the creatures during the show! And for everyone else, don’t fret, there’s a post-show meet-and-greet where you'll get up close and personal with the dinosaurs and maybe make a new friend or two. Just watch your fingers as you pet them! Not only is this marvellous Jurassic adventure entertaining, but it’s also completely mind-expanding. War Horse-style puppeteers manipulate a mass of different creatures, the likes of which include the T-Rex towering high above the audience as it has the whole family entranced. This natural history lesson will have your jaw hanging wide open as you become spellbound by Max Humphries' designs. The 50-minute show is written and directed by Derek Bond (Little Shop of Horrors, Sweet Charity) and has been a hit on its previous Mesozoic escapades. Not only does this interactive show let you get right where the action is, but unlike other theatre experiences, it also encourages you to take pictures and tag them online as you watch – what a great way to document your otherwise unbelievable adventure! Dinosaur World Live! tickets going extinct fast! You won’t want to miss out on this prehistoric expedition to see your favourite Jurassic beasts come to life. Tickets for Dinosaur World Live! are a guaranteed way to get into the good books of your kids and the show offers a perfect day out for everyone. Miranda, the T-Rex and her other dinosaur friends will be coming to the Troubadour Wembley Park Theatre this summer, beginning 18 July, which ensures at least one fun day out during the school holidays. Be sure to book your Dinosaur World Live! tickets now before they’re all snapped up! given that only 7 year olds and younger could get any enjoyment out of this show I thought the cost was excessive (total costs for day given that it was in london were extortionate). Won't be back. Only gave 3 stars because our 2 year old enjoyed it. Excellent show. My 3 year old grandson was in awe, and participated in all the cheering and laughs.